Making videos is an easy way to get and keep customers, and that’s what we want, isn’t it? 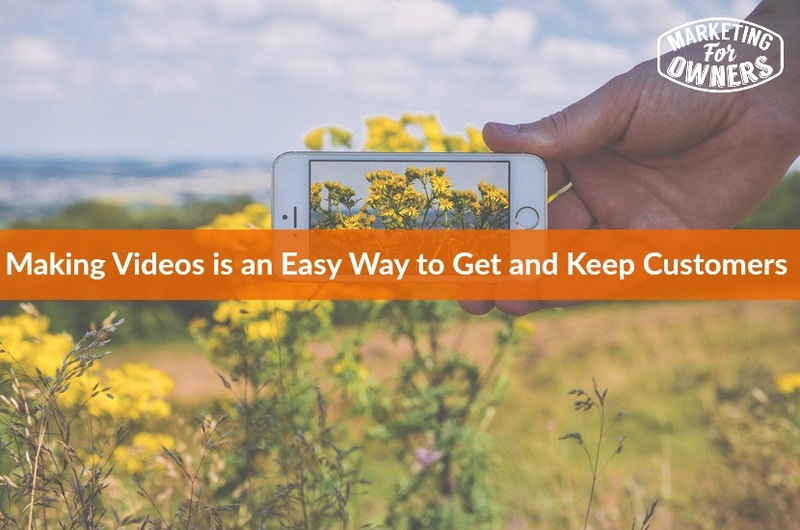 Video is one of the most popular things you can do and it’s so darned easy. Think of it, do we watch TV? Yes. Do we prefer radio? No. Radio came out, fantastic, TV came out, dump the radio let’s watch TV. Do we prefer to read the books or do we prefer to go to the cinema or the movie theater and watch a big movie? We prefer to watch it on a screen. It’s the same with everything, so video is where it’s at. And I want to tell you that video is easier than you think. For example, those of you that are watching on Youtube, I am using an iPhone 6, I’ve got a little microphone plugged into it, but I don’t actually need the mic because the microphone on the iPhone is pretty good. I could be using an android and that’s all it takes to make a podcast, because that’s all it is — it’s a video. In fact, when I put it on to iTunes and Soundcloud and Stitcher, then it’s just the audio but it’s from the same video. So, what can you use? You can use the camera on your laptop. They pretty much all have an inbuilt camera these days and they are very very good. If yours isn’t good enough or you’ve only got a desktop, go down to your local supplier and or look on Amazon and buy Logitech. There are HD cameras and they just plug in, they’ve got a microphone, they just sit on top of your screen, it’s a piece of cake. It takes no technical knowledge and they are of really, really high quality. So, YouTube as you know,is free, and anyone can create a YouTube account. If you’ve got a Google account or Gmail of any kind, you’ve already got a YouTube account even if you didn’t realize; uploading videos, a piece of cake. Most phones will have some kind of connection that upload directly to YouTube, because that’s a very popular thing to do. There are other places you can put them, like for our courses we park it on Vimeo, we actually use Vimeo pro, but there is a free Vimeo version it’s just like you tube, there is also Wistia; costs a bit more, does a bit more. I like Vimeo. But then, what are you going to use them for, how is that going to get you more customers? Well, for one, if you are watching this, how did that work for you? Why are you watching this? Why aren’t you doing something else? Because it’s easy. What am I doing? I am giving you a little tip, I’m telling you that it’s easy to get customers with video and you are actually watching, so it worked for you, why won’t it work for your customers? No, how about training? The webinar tonight will be on video. It will be a mixture of me, my screen, some slides, all that kind of stuff, but it will be run through what’s called a Google hangout. It won’t make any difference to you, you will just click on a page and it just appears but it’s actually run through Google, through Google hangouts. Millions of people around the world could be on, I doubt it will be that many, but it’s easy. I’m going to be giving six tips, it’s going to take an hour of my time and hopefully they will be so good that you will want to come back for my next live training. You can do that every single day, you can put them on your YouTube site, on your website by embeding the YouTube code afterwards. You can invite special customers for special training, you can show them how to use your product, you can show them how to fix faults, what to look for, unboxing, how to put it together; your product compared to a competitor, something like that. Or you can just talk to your audience, talk about your trade, your industry, things that will interest your audience. The more you do it, the more people will get to know you, they will get to know your personality, so don’t be a stiff, loosen up, jog around, be yourself, be funny. If you’re funny, I am not going to tell you any jokes, don’t you worry. Get me down the public, buy me a beer and I’ll tell you all my best jokes, it won’t take very long, I can’t ever remember them. But they get funnier the more beers you by me, by the way. So, there are ways, it works. People that I know like James Wedmore, he promotes his entire business on YouTube and he teaches you how to use YouTube to promote and he’s built that, from nothing into a seven figure, that’s over $1 million a year business. James is nervous, he’s on camera all the time, he is not a natural, he’s an introvert, he hates being on camera, but he’s figured it out, he’s got over it, it works. He makes lots of money and, why wouldn’t he like it? Do it, go on, I challenge you, I challenge you. If you want more ideas on how to do it, what you could do, just e-mail me at jon@marketingforowners.com , and I’ll answer you, you may be surprised, I read every single e-mail. That’s the end of that, you will figure it out. You can go on, it will be good. Today is Wednesday, still time for a friendly follow and today I’ve got an up and coming rising star. 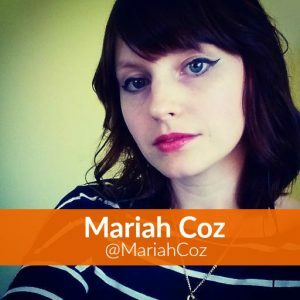 She probably thinks she’s been around for a while but she is great, Mariah Coz. Her Twitter handle is @MariahCoz. She’s a young lady, she’s great. The thing I like about her are her images; she’s like Regina at byregina.com in that her images are fantastic and it stands out. It attracts me and I don’t have an eye for images, I’m not camera buff or anything, but it makes her stand out. She teaches how to build courses, she teaches how to blog and how to do build a list. Now if you go to her website, which is femtrepreneur.co, and look at her homepage, you’ve got two choices, either get the course or read the blog. Clever, it makes you get used to clicking, sign up for her list, she’s a very, very good communicator, you will enjoy. I follow her, I think she is brilliant and I think she’s going to be a real mega star. Don’t forget to go on the webinar, remember the URL marketingforowners.com/go/livetraining. Just go and sign up all the details are there and I’ll see you later on, it will be fun. What video are you thinking of making?